In the summer of 2018, Glasstress hit the road once again! This time traveling to the 16th edition of Art Stays, the largest Slovenian festival of contemporary fine art, entitled Fragile, which focused on the fragility of art materials, fragmentation, processes of time or mere moments, destined to transform the quality of things, situations and sentiments. The festival addressed the fragility of relationships in modern society, the social, cultural and political history, as well as the question of human identity. The festival took place from July 6 to 13, 2018 (with exhibitions that ran until September 9, 2018) in Ptuj’s town squares and historical buildings, showcasing artworks created with a wide range of media: sculpture, photography, installations, video, painting, performances, and music. 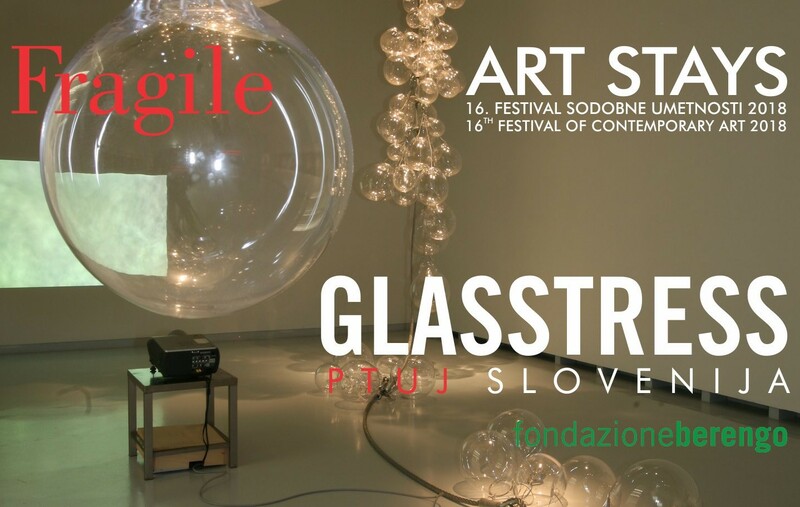 GLASSTRESS PTUJ SLOVENIA was the main exhibition of the year which was on display from July 6 to September 9 in the Ptuj City Gallery. Glasstress is a long term project, designed by Adriano Berengo to further his vision of uniting contemporary art and glass. Artists from all disciplines, from sculptors to musicians, have been invited to collaborate with maestros in creating art in glass. The exhibition was curated by the renowned Belgian artist Koen Vanmechelen, who has been collaborating with Berengo Studio since the ‘90s. The exhibition allowed visitors the opportunity to admire works by following artists: Ai Weiwei, Monira Al Qadiri, Jake & Dinos Chapman, Leonardo Cimolin, Josepha Gasch-Muche, Shane Guffogg, Brigitte Kowanz, Vik Muniz, Lucy+Jorge Orta, Thomas Schütte, Gavin Turk, Koen Vanmechelen, Fred Wilson, Erwin Wurm. The festival program was devised by Jernej Forbici and Marika Vicari, the directors of the festival, in cooperation with artists and international galleries, museums, public and private institutions including the Fondazione Berengo, Fondazione Modena Arti Visive, Arte Laguna Prize ̶ and a group of international curators: Antonio Arévalo, Italo Bergantini, Riccardo Costantini, Dušan Fišer, Carlo Sala and Koen Vanmechelen.